Local voters approved 63 percent — or 55 of the 87 — local tax, bond or fee measures on the June 5, 2012 California primary ballot, according to Michael Coleman, the creator of CaliforniaCityFinance.com. Majority vote measures fared much better than supermajority votes requiring two-thirds approval to pass special taxes and bonds. Fifteen of the 19 majority-vote measures passed (79 percent). But only 18 of the 34 supermajority vote taxes passed (53 percent). For schools, voters favored approval by 66 percent; that’s compared to 45 percent for non-schools. Analysts will not get much direction from these local election results in trying to handicap the mood of voters to pass Gov. Jerry Brown’s $8.5 billion tax increase initiative this November. Even though a balanced budget is constitutionally required to be approved by June 15, it was just reported that the leadership in the Legisalture still refuses to cut $2 billion in social spending to meet Brown’s budget proposal, which itself appeared to analysts already to have a $4 billion deficit. The results below confirm that voters support their own local schools. But it is unclear if they will tax themselves more for the benefit of the state. 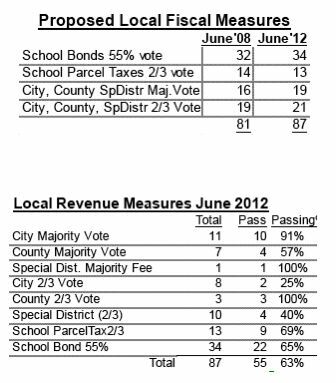 Of the school parcel taxes measures requiring a two-thirds supermajority, nine the 13 passed (69 percent). All received well over 60 percent yes votes. Of local school bond measures requiring only the the 55 percent threshold passed, 23 of 34 passed (77 percent). They will raise $1.9 billion. For use sales-tax add-ons, eight of nine cities were approved (89 percent). Only the City of Alameda failed, because the earmarking of the use of the tax required a two-thirds majority approval. Since 2001, about 60 percent of measures to increase general purpose local sales taxes have passed, but only 36 percent special sales tax increases requiring a two-thirds majority vote have passed. Two of the five ballot measures to increase or expand hotel Transient Occupancy Taxes passed (50 percent). Of the two utility user tax measures on the ballot, both failed. An “advisory” vote in Stanton on how to spend the money passed, but was irrelevant. Two of the four business license tax increases passed, one failed, and a third, San Mateo Vehicle Rentals, is still too close to call. 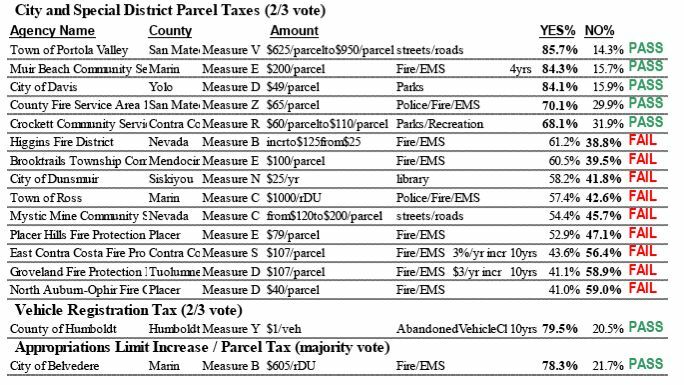 Only four of the 14 of the city parcel and special district parcel tax increases passed (29 percent). Proposition 13 requires two-thirds supermajority approval. Both cities that attempted to gain the two-thirds voter approval to issue general obligation bonds failed. By comparison, over the last 12 years, about 50 percent of the general obligation bond measures have passed. Both of the public employee pension reform proposals passed with big majorities. 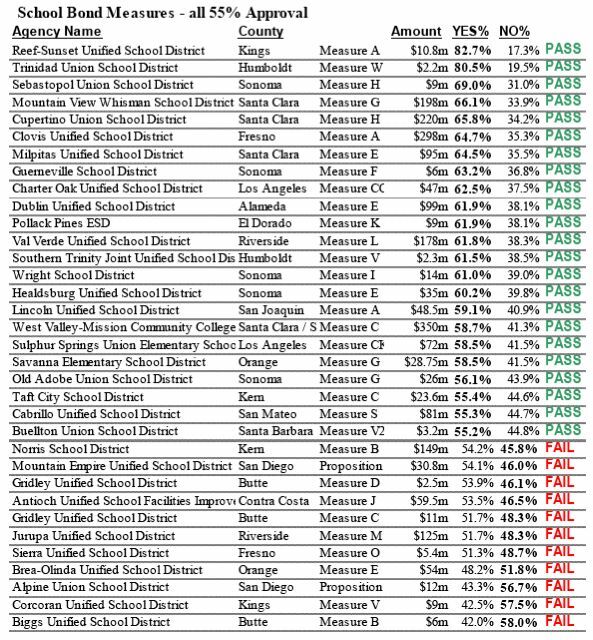 Orange County’s Measure A failed. It was a proposal to have the Board of Supervisors appoint the county public administrator, who protects the assets and manages the affairs of residents of the county who die with no known heirs, will or executor. Also failing were efforts to deny voters the right to elect the city clerk and city treasurer in Ukiah and Antioch. But Calexico approved similar measures. Voters in El Cajon approved the establishment of a city charter, but voters in Auburn turned down charter city status. You are so right, Beeb. There will be no meltdown or gloom and doom….such talk is out of step with reality. Month after month…..gloom..doom…..but it looks good out there and getting better too! A slight revenue increment will balance our state budget….the voters will approve it hands down! Glad to provide a public service! A quick perusal of the tables above suggests that a significant amount self selection is skewing the local tax increase votes. I think many tax and bond measures don’t even see the light of day in more conservative and rural areas where the big government proponents are politically weaker. Most tax and bond measures occur in typically tax happy left/liberal counties and cities. The line items with a PASS description seem heavily weighted to the usual lefty strongholds in the Bay Area and Northern Coastal Birkenstock wearing, chardonnay sipping enclaves. Having said that, it’s still annoying to see how many clueless Kalifornians are willing to throw endless sums of money into the bottomless pit of government education, where most of it ends up in the grubby hands of the teachers unions and feckless education bureaucrats. The operative principle seems to be that the greater the failure the more that must be spent. It’s the kind of witless zombie like behavior we have come to expect from our blue team brothers and sisters. B’bub, your ascerbic opinions crack me up. Queegy, I have finally figured out where you’re coming from. You live in a parallel universe that sporadically and randomly impinges on reality according to the enigmatic laws of quantum mechanics. Chris, no one can accuse you of avoiding the hard data. This article has enough tabulated info to satisfy the wonkiest, green eyeshadiest, sleeve garter wearing data jockey. I think I have spread sheets burned on to the inside of my eyelids just from glancing at it. The only known cure for this condition is an evening of bourbon slurping, which coincidentally occurs in my house every Friday evening (for medicinal purposes of course). I differ with you on one point B’bub. I don’t think the banksters will be left holding the smelly bag of doo doo. They have the politicians by the small hairs. Central banks will monetize the debt and stuff the bankster vaults with gobs of “liquidity”. John Q. Public will get socked with hyperinflation, sky high taxes and asset seizures as a result. Very ugly and coming to a welfare/warfare state near you. Remember, “the revolution will not be televised” (Gil Scott Heron) and “Optimism is Cowardice” (Oswald Spengler). B’bub, give me some credit. I have been reading world history since I was a snot nosed laddy. Currently I am engrossed by Pat Buchanan”s excellent “A Republic, not an Empire”. That largely explains my cynicism. I think you give the mob too much credit. When they explode often they just burn down their own neigborhoods like the L.A. riots. Don’t underestimate the Jamie Dimons, Lloyd Blankfeins and Ben Bernankes of the world. Their skullduggery is of a fiendishly subtle and effective kind. I agree that the coming bailouts will be massive, but Central Banks can create a zillion dollars with a keystroke. They always take the easy way out. Wow, what is going on here.  More deleted posts! B’bub exceed his ration of comments for the week or something? Some explanation would be nice O great and mysterious moderator. Without the missing comments everything else on this topic is now disjointed and out of context. Am I next? Without me and the ‘Bub it might get pretty boring around here. What is not mentioned is that the backers of these local sales tax increases know pretty much in advance what the outcome will be. Typically, they get a survey firm to figure out if the tax increase has a chance and what lies need to be told to the suckers…er…sorry…voters in order to get the tax increase passed. Then the survey is presented to the local politicians to get them to put it on the ballot instead of requiring public signatures which is much more expensive than a survey. If the survey indicates the tax increase wouldn’t pass it never gets put on the ballot. So we really don’t know what the public mood is for local tax increases or how many tax increase measures would have been defeated since many never get put on the ballot to begin with. Wonder be positive….will pass and California will continue to positively restructure….. The tax increases will pass because most of the voters don’t pay taxes. But the tax increases will never work. Just look at Illinois. 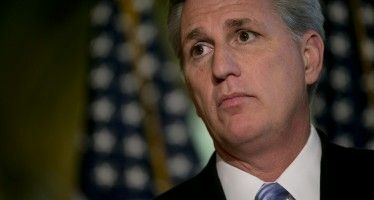 They passed huge tax increases to balance their budgets and they are facing more huge deficits. When you pay public employees 400k pensions for working only one day in the school system, like what happened in Illinois, you have no chance of balancing anything.